Commonwealth Avenue Bridge Replacement Project is a construction project to replace the bridge’s existing superstructure of steel beams and concrete deck, which carries Commonwealth Avenue and the MBTA Green Line B branch over I-90 (Massachusetts Turnpike) and the MBTA Commuter Rail line. The construction is necessary because the superstructure is in poor condition. The deck has deteriorated and the beams are significantly corroded in numerous places. The project will include the replacement of the bridge’s entire superstructure and will also involve adding functional and safety improvements, including utility relocations, dedicated bike lanes and extensive pedestrian upgrades. Accelerated Bridge Construction (ABC) methods are being implemented in the Commonwealth Avenue Bridge Replacement Project to shorten the duration of onsite construction time. Conventional bridge replacement techniques would have required 4-5 years of construction and bring related traffic and transit impacts. In contrast the ABC methods will allow the project to be completed in two intensive construction shutdown windows. The first shutdown will take place from Wednesday, July 26, 2017, to Monday, August 14, 2017 and the second shutdown will occur in the summer of 2018. The project’s design was fast-tracked by bringing multiple firms together to contribute collectively to the final design and construction plan. The construction management team, led by Walsh Construction Co., will use precast concrete elements and rapid-set concrete, and will construct the deck panels off-site for positioning when needed. The construction team will work in continuous shifts, 24 hours a day, during the intensive shutdown periods. 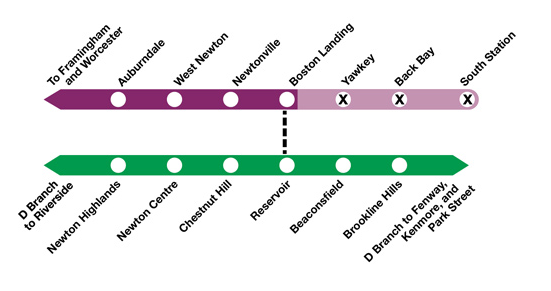 This phase of the project includes replacement of Commonwealth Avenue eastbound and the MBTA Green Line B branch right-of-way. The following roads and facilities will be impacted: Commonwealth Avenue between Brighton Avenue/Packard’s Corner and Kenmore Square, the Boston University (BU) Bridge, I-90 (Mass Pike), the MBTA Green Line B branch, Bus Routes 47 and CT2, Commuter Rail Worcester Line, and Amtrak’s Lake Shore Limited. See the Traffic Management page for a detailed impact schedule and detour routes and maps. The construction shutdown with impact the Mass Pike between the Allston Interchange and the Beacon Street Overpass from 9:00 PM on July 28 to 5:00 AM on August 7. This section of the Mass Pike will be reduced to two lanes in each direction during peak hours and it will be further reduced to one lane in each direction during weekday nights and over the weekends. The I-90 Westbound Exit 20 off-ramp to Brighton/Cambridge will be closed intermittently and the I-90 Eastbound on-ramp from Cambridge Street/Soldiers Field Road will be closed during the entire period. The Mass. Pike will return to three lanes on Aug. 8, and four lanes on Aug. 28. During the construction shutdown drivers could face up to an additional 40-minute delay at times. Dial 511 and select a route to hear real-time conditions. Visit www.mass511.com, a website which provides real-time traffic and incident advisory information, and allows users to subscribe to text and email alerts for traffic conditions.